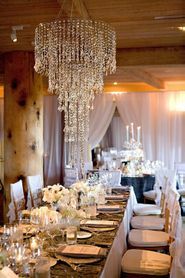 When it comes to event decorating, the versatility of chandeliers like our lovely "Ireland" with 2 tiers of delicious crystal iridescent beads, offers options that wedding planners and DIY decorators absolutely love! From the top tier to the bottom bead, Ireland is 4' long, the outer ring is 8 5/8" in diameter and the inner ring is 7". This comes with a 9" long hanging chain. The swirling tiers of iridescent beads look incredible hanging overhead or on a riser for a floor accent piece or as a table chandelier. 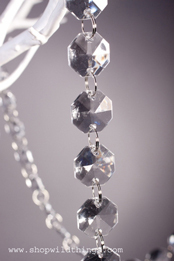 The faceted beads provide tons of sparkle and each strand ends with a 1" long pendant. This chandelier weighs 3.3 lbs. Ireland does not come with a light source but is designed to hold one. This feature gives greater decorating flexibility and if a light is desired, simply downlight with an LED Light Saucer or use a light cord kit. For a table chandelier, even a 2' tall vase works wonderfully because the glimmering beads can pool on the table (to be admired up-close!). Or, choose a taller piece like our Chrome Centerpiece Riser. Fabulous for an entryway, as aisle markers or for a foyer or dining room, this chic chandelier also makes a spectacular show stopping floor decoration. Place Ireland on top of a Height Adjustable Riser and optionally add a light source. 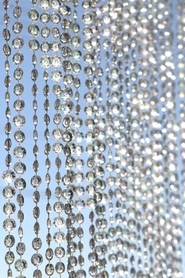 We have many gorgeous acrylic beaded curtains and garlands to match this chandelier. 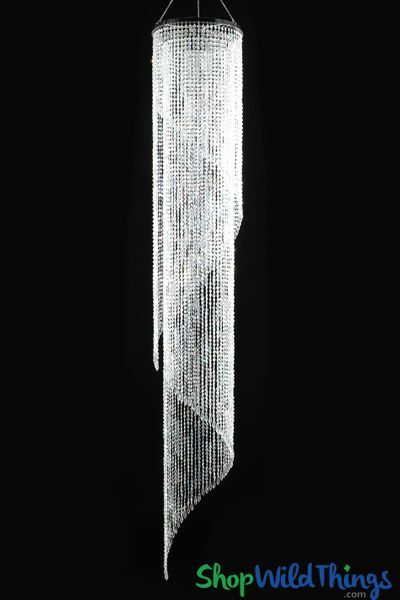 Our Diamonds Crystal Iridescent Beaded Curtains will match this Chandelier perfectly. Also, many MANY clients mix and match both Iridescent and Non-Iridescent Finished items. They look great together but if you're stuck and need design ideas, check out our Decor Photos & Ideas Page.